Paciﬁc Media Centre | articles: Backgrounder: Is the tsunami too big to beat? From floods to volcanoes, man is in constant battle with nature. Japan shows us the tsunami may be beyond our control, writes Bill McGuire. OPINION: It was chilling to see the aerial footage of the debris-laden tsunami sweeping across the flat, featureless landscape of eastern Honshu. Its staggering power has done untold damage to lives and property. Natural hazards, which I study, take on a wide variety of forms, all of which have the potential to cause mayhem on a biblical scale. Generally, though, their impact affects a single city or region. But great underwater earthquakes are very different. 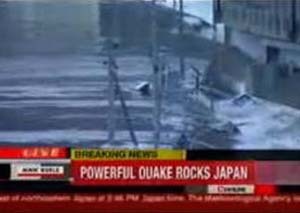 When they are as big as the quake that struck off the northeast coast of Japan – at magnitude 8.9 the largest ever recorded there – and shallow, so that a large part of the energy released jolts the sea above, they are capable of transporting death and destruction to places far removed from the earthquake source. Just over six years ago, tsunamis transmitted the energy released in the Sumatran earthquake as far afield as Thailand, Sri Lanka and east Africa, killing tens of thousands too far away to have even felt the earth shake. As I write, waves of destruction are heading across the Pacific towards Hawai'i and beyond. The sheer scale and extent of big tsunamis are sufficient to make even the most optimistic hazard scientist or emergency manager stop and think. Are some natural phenomena simply too big to plan for or cope with? There is always something we can do to mitigate or manage the impact of a natural hazard – be it an earthquake, volcanic eruption, flood or tsunami. It is just that some are harder to tackle. For active volcanoes we can track the warning signs – such as ground swelling – that tell us that an eruption is on its way, and get people out of the area. Although we still cannot predict them, we can make earthquakes far less lethal by making buildings "life safe" – in other words, ensuring that they are engineered so as to remain reasonably intact during the strongest shaking. With floods we can build defences and make sure that homes and vital infrastructure are not built in the flood plains. With tsunamis, however, reducing their potential for serious damage and loss of life is a far harder challenge. Barriers can be constructed to protect critical facilities, such as refineries or nuclear power plants, but you can't surround entire ocean basins with concrete. Warning systems are fundamental, and the Pacific tsunami warning system, based in Hawaii, played a crucial role in alerting nations across the Pacific to the fact that yesterday's tsunami was on its way. But it is likely that any tsunami will reach those who live in coastal communities close to the earthquake source long before the warning does. Ultimately we are constantly engaged in asymmetric conflict with nature, where we will often be on the losing side. But thankfully we are never entirely powerless. In the case of the tsunami threat, we can save lives in future events through education of populations living close to submarine faults that have records of spawning big waves. One of these lies off the Sumatran coast, adjacent to the heavily populated city of Padang, where a timely self-evacuation when the ground shakes could save tens of thousands of lives at some point in the future. On the other hand, reducing the destructive power of tsunamis is close to being a lost cause. Mangroves and tree plantations can help to some degree by breaking up the incoming flood, but no one who has seen the immense power and momentum of the Japanese tsunami can be under any illusion that these would have made much of a difference. The reality is that we can only do so much, and sometimes that is simply not enough. Bill McGuire is the director of the Benfield UCL Hazard Research Centre. He is author or editor of over 400 books, papers and articles focusing on volcano instability and monitoring, natural hazards and environmental change, climate change and global geophysical events. This article was first published in The Guardian.